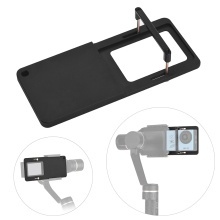 Adapter mount plate is suitable for GoPro Hero 6/5/4/3+, for Xiaoyi YI 4K, for SJCAM, Meeegou and other similar size sport cameras, which can be mounted on gimbal for DJI OSMO Mobile 2 or Zhiyun Smooth 4/Q, etc. Effectively makes camera more stable when taking photos, and provide you higher quality photos and videos. Comes with an adapter plate, an U-shaped fixture and 2 screws, very easy to install and use. Made of high quality aviation grade aluminium alloy, comfortable hand feel, durable to use. Note: Handheld gimbal and action camera are not included. Compatible Gimbal: For DJI Osmo Mobile or Feiyu gimbal or Zhiyun Smooth 4/Q gimbal, etc. Compatible Cameras: For GoPro Hero 3/3+/4/5/6, for Xiaoyi 1/4K, for SJCAM, Meeegou action camera, etc.